Typical of any Mercedes, the S550 comes well equipped and offers a host of options and accessories to create a more personalized luxury sedan. Out of the box, the S550 brings home thick, supportive seats upholstered in handsome leathers, careful use of exquisite wood and aluminum trim joined with exceptionally fine vinyls and plastics, and a spacious cabin and trunk. Even the carpeting is of a higher-than-average caliber. 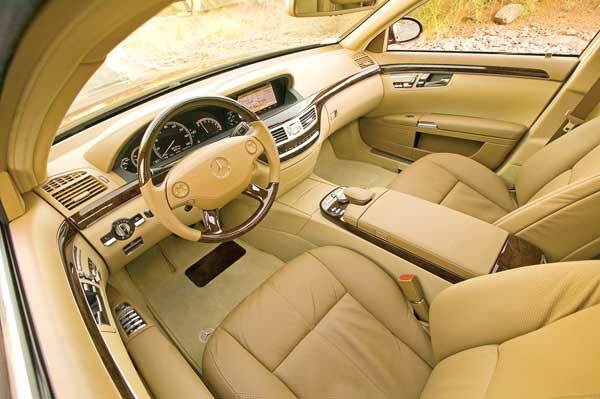 As with most things Mercedes, the S-Class feels well thought out, the fit and finish are of the highest quality and the driving position is difficult to fault. This is the way a flagship sedan should be. The S550 has been a popular pick not only for its lengthy list of features, but also because it offers the perfect balance of these features for the money. While not quite as posh as the S600, the S550 still coddles passengers. While not as aggressive as the S63 and S65 AMG road boilers, the S550 performs with the spirit of a car weighing one-third less. And while not as green as the new S400 Hybrid, the S550 still brings home an agreeable EPA rating without the worries of battery longevity. So customers get a little of each S-Class expression for a very agreeable sum. For 2010, Mercedes has upped the ante with a small battery of improvements and additions such as Attention Assist, improved head unit with integral Bluetooth, HD radio, USB and SD card sockets, whole-word voice recognition, 4G music register, and Zagat hotel and golf rating information, to name just a few. Maintaining its reputation for advanced safety, Mercedes has introduced Nightview Assist PLUS with pedestrian detection, Lane Keeping Assist, Adaptive High Beam Assist, pre-safe brake with automatic emergency braking and advanced tire pressure monitors. Inside, the upholstery design has been slightly updated, wood appointments are restyled and a new three-setting ambient interior lighting system debuts with Solar (amber), Neutral (white), and Polar (blue) colored illumination options. Buyers can also indulge in an optional rear seat entertainment system. Outside, a new grill, bumpers, active bi-xenon headlights, larger side-view mirrors, daytime running lights, and restyled LED taillights mark the changes for the 2010 S-Class. The end result is a modernly appointed vehicle with a higher degree of safety and style. While colors have never been in short supply at Mercedes, the company has been promoting a more generous palette of handsome hues to choose from, aiding clients in building a more personalized car. Propelling the hefty sedan to 60 miles per hour in just over five seconds is the 5.5-liter, 32-valve, 382-horsepower engine, which is mated to a 7-speed automatic transmission. This combination results in a 14 MPG city/22 MPG highway rating. With performance and equipment like this, the massively comfortable and well-equipped S550 gives reason to reconsider the purchase of an exotic sports car. Historically, what has made a Mercedes a Mercedes is the philosophy behind the Star: the car should feel as good 20 years on as it does the day you buy it. The body is exceedlingly stiff, with a silence factor rivaling a coffin and doors to make a bank vault jealous; the switches and controls inside feel solid without being hard to press or turn; the steering is tight at higher speeds aiding in a superior degree of control, while parallel parking is a single-finger spin-the-wheel affair. Properly equipped, the S-Class becomes even easier to park, thanks to a rear-mounted camera and sonar detectors alerting you to objects in your path and their striking distance. Overall, you feel rewarded and refreshed having driven the S550, which is something special in itself as not many cars provide such a sensation. Owning an S550 would be an equally rewarding proposition, making everyday commutes something of a joy rather than a chore. And the Mercedes service plan will promise peace of mind year after year. Even when its warranty has expired, the Mercedes mantra of Service Forever promises that you’ll be able to keep your Benz on the road and looking stellar for years to come. The S550 will age gracefully, becoming not an outdated car, but a vintage masterpiece. Take a test drive at Mercedes-Benz of Sacramento, 1810 Howe Avenue, Sacramento. 916-924-8000, www.mbsacramento.com. Or Mercedes-Benz of El Dorado Hills, 1000 Mercedes Lane, El Dorado Hills. 916-939-5223, www.mbofedh.com.